Home > Testimonials > Nancy D.
Wanting to move to Truckee from the Bay Area, I asked friends who live in the area for advice. 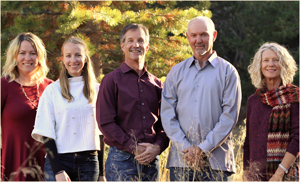 Without hesitation they referred me to Matt Hanson of Tahoe Truckee Homes. From the very first phone conversation with Matt, I knew I had found someone I could easily work with and trust. Rather than “sell me” on certain properties, Matt interviewed me to understand what I was looking for and educated me about the neighborhoods so that I knew where to concentrate my search. In person, Matt drove me through the possible neighborhoods and showed me many properties that met my criteria. The more we looked at properties the more he (and I) understood what I was looking for to the point where if I asked him about a property I had seen on the web, he would frankly tell me whether or not it was worth my time to see it. For example, I saw a beautiful place advertised on the web. When I asked Matt about it, he told me that I probably wouldn’t like the neighborhood. Undeterred I drove by the property myself. He was exactly right, the beautiful new place was in the middle of a neighborhood in which I wouldn’t have felt at home. After that, I followed his lead and we found a house that more than met my needs. He walked me through the negotiation process and assured me that we’d settle on a fair price. Although more than what I had originally budgeted, I closed on a house that was more than what I could have hoped for in a fabulous neighborhood. Even better, the day I moved in, the value of the house was more than what I had paid. His service didn’t end there. He recommended local inspectors, handymen, cleaners, window washers, window covering people and more. He’s very generous with his time and care, shoveling a foot and a half of snow off my driveway the day I moved in, lending me a shovel until I could buy my own and even delivered a gallon of gas when my car was delivered almost empty. I not only found a great realtor, I found new friends in Matt, his wife Stephanie and their adorable dog Chai. Don’t look elsewhere, just give Matt a call and tell him I sent you.